Dimensions: 6-1/4 x 6-1/4 in. 10 pages. Board book, full-color images throughout, for ages Infant-3. Inquisitive toddlers can lift the flaps to uncover silly surprises in this clever early concept board book. Simple text and die-cut pictures prompt toddlers to identify the color and then guess what hides behind each flap. From lily pads that are green (like...a frog!) to flowers that are purple (like...a butterfly! 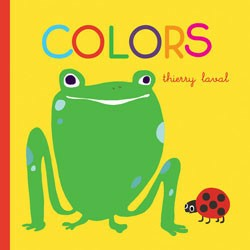 ), this adorable, one-of-a-kind board book offers a fun new twist on learning colors.